Twenty-five years ago, the Shreveport Bar Association had a problem. Naturally, a lawyer had the answer. “The Bar Association was in the process of hiring an executive director for the first time,” recalled attorney Neil Erwin. “The question came up as to how we were ever going to be able to pay for that. I raised my hand and said, ‘Why don’t we have a Mardi Gras Krewe? There are some forming right now, and before lawyers get scattered into those other groups, why don’t we form a legal krewe and maybe we can raise enough money from that to be able to pay half the salary of the executive director?’” Thus, the Krewe of Justinian was born. Now celebrating its silver anniversary, the 200-plus members – who come mostly, but not exclusively, from the legal community – have far exceeded paying half of the bar association’s executive director’s salary. “We have donated, in the 25 years, hundreds of thousands of dollars to the Shreveport Bar Association and the Shreveport Bar Foundation,” said attorney and krewe member Layne Clark. That money helps the Shreveport Bar Foundation help people who – mainly for financial reasons – can’t hire an attorney. However, the Krewe of Justinian – named after the emperor who was one of the first people to have a code of laws – is not all business. And that has led to relationships which may have never been formed. “Two years ago, my wife and I attended the Kentucky Derby,” said attorney and Captain Lyn Lawrence. “It was a 50th birthday present, actually. We weren’t thinking about it as a theme, but on the way home, we said, ‘We can have some fun with this!’” Since then, the krewe has done just that. “The royalty went to Lone Star Park in Grand Prairie, Texas,” Lawrence said. “We rented a suite. We had our picture taken with the winning horse. They even named a race after the krewe – ‘The Krewe of Justinian 25’ race. We (royalty) took in Kentucky Derby Day at Louisiana Downs. The ladies wore their nice hats. The men wore their wild suits. 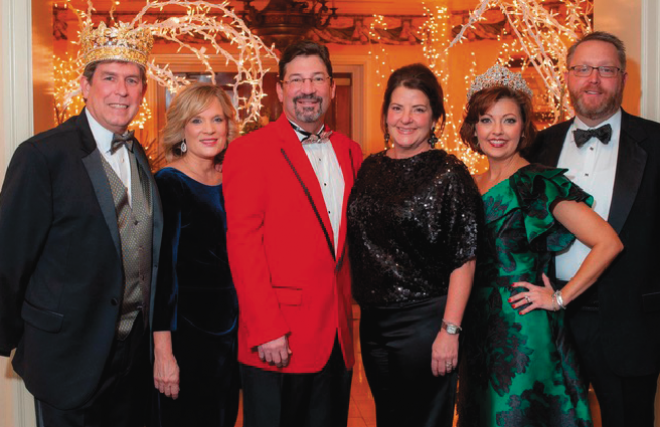 We had a great time!” Each August, the Krewe of Justinian has a Coronation Bal, where the year’s new royalty is announced. Other events include the Midway to Mardi Gras Party, a 5K run, and the King and Queen’s Dinner. As with other krewes, the highlight of Justinian’s Mardi Gras year is the Grand Bal, followed by a Krewe Brunch. This year’s Grand Bal is Feb. 1 at Horseshoe Casino’s Riverdome. That’s a long way from the krewe’s first Grand Bal. That’s just another example of how the Krewe of Justinian has grown. If you would like to learn more about the Krewe of Justinian, you may visit www.kreweofjustinian.com.